Tenley “Ten” Lockwood is an average seventeen-year-old girl…who has spent the past thirteen months locked inside the Prynne Asylum. The reason? Not her obsession with numbers, but her refusal to let her parents choose where she’ll live—after she dies. There is an eternal truth most of the world has come to accept: Firstlife is merely a dress rehearsal, and real life begins after death. Before reading this one, as I often do, I headed over to Goodreads to see what the word on the street was. I was surprised at all of the negative reviews, which definitely made me hesitant, but I decided to read it anyway. And... I am SO glad that I did. Ten has been locked in an asylum for thirteen months, suffering torture and abuse at the hands of the doctor and the staff. All she has to do is sign her Everlife over to Myriad, and it all stops and Ten is free. But Ten refuses to be forced into making a decision. She wants the choice to be hers and hers alone, and right now? She just isn't sure what the best choice is. What Ten doesn't know is that she is something different, someone who would be very important to both realms, and they will stop at nothing to get her on their side. And if they can't do that, one realm is willing to kill her to prevent the other from getting her. 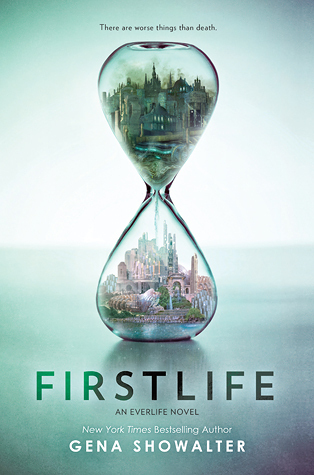 Firstlife is non-stop action, and one emotional roller coaster after another. What Ten is put through in the asylum will make your blood boil, and when she is finally free things continue to get worse. There is one big difference on the outside though. Ten is surrounded by an amazing group of people who become so important to her. Archer and Killian, bitter enemies, initially come to recruit Ten. But they start to care for her, and they come together to ensure Ten's safety. They make sacrifices along the way, and they both grow exponentially. Ten is a tough character, strong and resilient and firm in her own beliefs. She stands firm behind her decision to wait until she is ready, despite the hardships she faces. I have seen frustration expressed because she refuses to just sign with one realm or the other, but I understand wholly. When you are unsure of where you belong, you don't just settle. You weigh the pros and cons, consider it from every aspect, so that when you finally decide, you know the decision you make is the right one. When Ten makes her decision, she makes it because it is the right one for her, and she feels peace in her decision. She didn't jump the gun, or relent to the constant pressure. I respect her 100% for that! If you had a decision to make, and you were unsure about it, would you let someone pressure you into making that decision or would you wait until you felt peace about it? I genuinely can't think of a thing that I didn't enjoy about Firstlife. I adored the characters, the villains were wonderfully villainous, the action was non-stop. The emotions ran high! I adored this book. If you read this review, and have felt a little wishy-washy about reading this book because of the reviews, I would definitely tell you to at least give it a shot. And if you do, I hope you like it as much as I did!